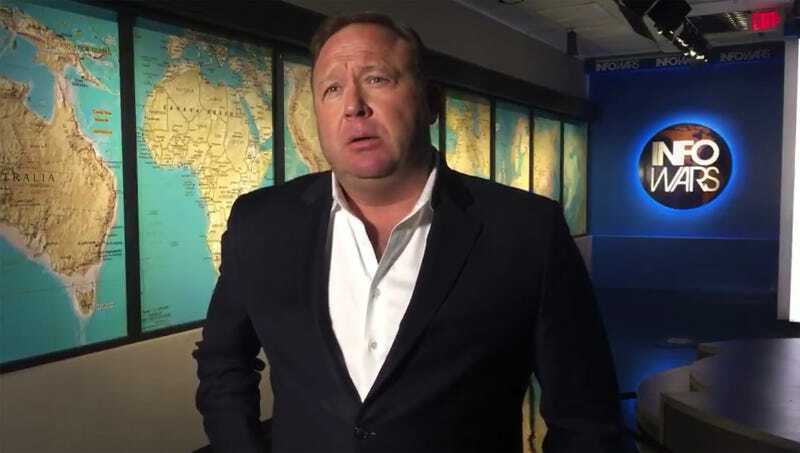 AUSTIN, TX—In response to multiple families suing him for defamation over his claims that the 2012 shooting was a hoax, InfoWars host Alex Jones plead with Sandy Hook parents Tuesday to imagine the enormous pain that such an expensive lawsuit would cause him. “Please, I’m begging you—have a heart and think about the suffering that a devastating courtroom experience like this would put me through,” said a forlorn Jones, tearing up as he openly asked what sorts of monsters would force him to endure the costly ordeal of defending himself in court merely for saying the shooting that claimed the lives of their children was entirely staged and perpetrated by opponents of the Second Amendment. “Before you hurt me any more than you already have, just put yourself in my shoes: After everything I’ve already endured, I’ll have to carry around the misery caused by this $1 million payout for the rest of my life. All that money—my money—would just be gone. Can you imagine that kind of loss? It’s just so senseless.” At press time, Jones had filed a $1 million countersuit against the parents for the pain and suffering their lawsuit had caused him.